Boat trips. Do not wait until the last second: book now! 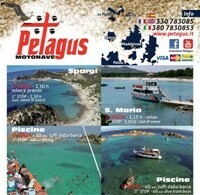 With Petagus you can purchase a ticket for trips to the islands of La Maddalena Archipelago. If you are planning your vacation in Sardinia this summer and do not want to leave anything to chance or you're already here on vacation, maybe in Orosei, Budoni or Castelsardo and you do not feel like coming to Palau without being able to embark, buy tickets online! Instant availability in real time and payments with paypal or credit card. What are you waiting for? Motonave Petagus sails from May to September. Book a Dinghy tour Arcipelago La Maddalena! The novelty of 2017 is that it will be possible to visit the islands of the archipelago of Maddalena in a inflatable raft! If you prefer to book a raft trip with your other half or you are with a group of friends, buy an online inflatable ticket or rent a single-hull inflatable boat. You can choose from the 3 routes that Petagus has made for you and experience Lavezzi and Piana Island in Corsica. The tour of the archipelago La Maddalena islands lasts for a whole day. The seven hours of the excursion consists of many stops in paradise, amazing experiences that turn the day into a lifetime memory with full of emotions! By clicking on the images of the itinerary you will be directed to the pages with the details of the individual tour trails. Alternatively, if you'd like to "peek", check out our virtual tour with Google satellite view along with descriptions and images of places you can visit. In all these years of activity we have collected the questions most frequently asked by our guests before buying the excursion. What time does the tour begin? Is there parking near the harbor? How are we to dress? Can we bathe? Is there a restaurant/bar? Here, on the Frequently Asked Questions page you will have the answer to your question. If not, do not hesitate to contact us. Check weather conditions to make sure that the Maddalena archipelago tour or your raft trip takes place in the best wind and sea conditions. Click on the image to download the brochure of the tour of Petagus! Buy your tickets for the Maddalena Archipelago Tour! Take advantage of the discounted prices and deals we have to offer with our online ticket sales, and avoid boring queues at the ticket office. Click on Buy Now!